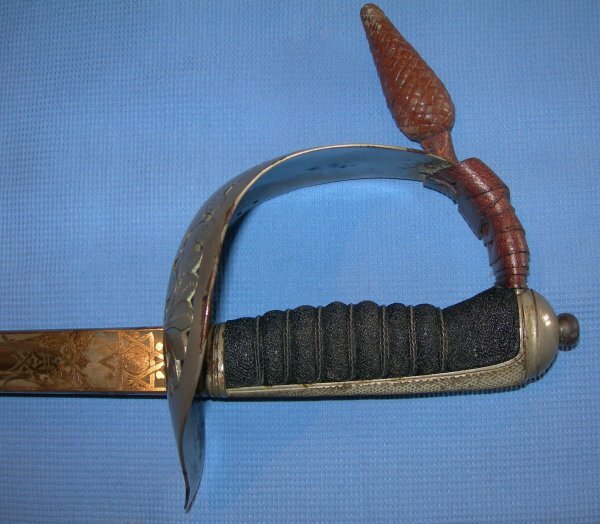 A scarce WW2 era Royal Army Ordnance Corps officer's sword in good to very good condition. One of the most uncommon 1897P infantry swords, one etched to the Royal Army Ordnance Corps. 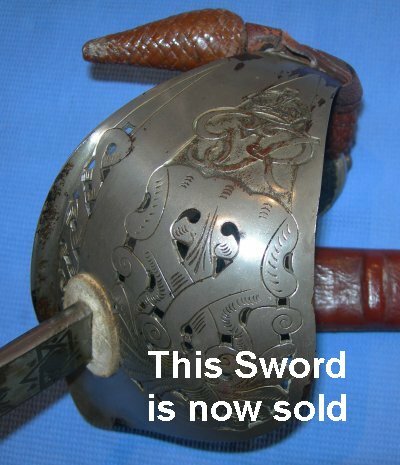 The 32 1/2 inch blade is in very good condition, a couple of minor patina areas, nothing major. The blade has the Royal Army Ordnance Corps arms and motto one side, and a crown the other; interesting in that it is a crown alone, not the royal cypher of King George 6th, so the blade will not go out of date unless the crown does. The hilt has some rust spot areas but is good overall. The black fishskin grip and twisted wire bindings all very good. The leather fields service scabbard and sword knot are in good order. The sword sheathes and draws well. Further / full sized images available upon request. My reference is 791 (332).